2. Maurice Raynaud (1834-1881). 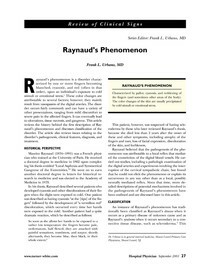 Raynaud\u2019s disease. 1998. Scand J Rheumatol 1998;27:319\u201322. vey. Occup Environ Med 2000;57:448\u201352. non. Scott Med J 1999;44:4\u20136. 7. Raynaud\u2019s phenomenon. Lancet 1995;346:283\u201390. phenomenon. Postgrad Med 1985;78:175\u20137, 180\u20133. Maurice Raynaud. Br J Rheumatol 1990;29:162\u20135. adults: diagnostic considerations and management. Copyright 2001 by Turner White Communications Inc., Wayne, PA. All rights reserved.